Healthy fruit trees require adequate fertilizer and nutrients each year. 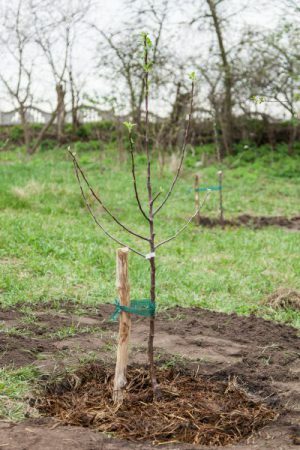 Healthy fruit trees are hungry trees, as they need adequate nutrients to support, not just the crop of fruit you wish to harvest, but the re-growth and new growth that the tree needs to feed in order to increase in tree size. The basic nutrients that fruit trees need are the “Big 3”: nitrogen (N), potassium (K), and phosphorous (P). These are the ones that are most rapidly deleted from the soil throughout the year either by the tree taking it up or in some cases by the nutrient “leaching” out of the soil. Highly mobile nutrients, like nitrogen and potassium, dissolve in the moisture in the soil and thus are more readily “leached” out when over-watering or heavy rain occur and the moisture runs through the soil profile. It picks up the nutrients, and carries them below the root systems. Phosphorous is less mobile, so it leaches less. Many soils is seem to have adequate “P” levels from year to year, but, each year the levels of nitrogen and potassium need to be replenished, since they are either used up or have leached out. There are many “minor elements” that healthy trees also need to grow and produce fruit. The major ones are magnesium and calcium, but there are several others. Oftentimes, soils seem to have adequate levels of these naturally, so unless a deficiency appears, very low level applications of minor elements can go a long way. Most of the minor elements are required for efficient photosynthesis, quality fruit and other plant functions. There are many ways to provide proper nutrition. While Grandpa is still an old timer and doesn’t play an instrument on the organic bandwagon, he has no problem with those who do. You can provide proper nutrition, through the use of either inorganic or organic fertilizers. In most cases, the fruit tree doesn’t seem to know the difference because both types provide the types of nutrient in forms which the tree roots can take up. An old rule of thumb is that many fruit trees, like apples and stone fruits, annually need about one tenth (1/10 or .1) pound of actual elemental nitrogen per one inch (1”) of caliper of the trunk. This is a very broad rule, but fairly good since nitrogen is the nutrient most required for growth and also the one which disappears from the soil most rapidly. Pears require about one-half as much. The maximum amount of actual nitrogen to be applied to a tree is about 1 pound of nitrogen per year. If you have really old, big semi-standard trees, they may require more, especially if you haven’t been pruning them. Smaller semi-dwarf and dwarf trees are more easily pruned and taken care of. Often the quickest way to feed a tree is with inorganic granular fertilizer. This is easily purchased at local garden centers, farm stores, etc. On each bag you will typically find a set of three numbers like “12-12-12” or some other set. The first number is the percent of actual elemental nitrogen (N) in the formula, the second is elemental phosphorous (P), and the third is elemental potassium (K). While most trees need more nitrogen and potassium each year than phosphorous, it is often hard to find many formulations that don’t have phosphorous in them. There are many, many fertilizer formulations with names like Calcium Nitrate (usually about 16%N), potassium nitrate, urea (45%N). Don’t be too confused by the names, but be aware of the relative ratios of the “Big 3”. Some formulations may also have some of the minor elements also, and these are useful additions, but may not always be deficient in your orchard. Compost, manure, and other organic sources of nutrients can be substituted for granular or inorganic fertilizers. Often, these forms have much less actual N-P-K in them, so more product must be used to supply enough nitrogen in many cases. They can be more expensive sources of nutrients, but as they are organic, their organic components often provide many other good qualities which improve soil condition. If purchased, these organic sources should also be labeled similarly to the inorganic fertilizers with the N-P-K ratios listed on the container. When using manure, be careful that it is not too “fresh and hot” out of the critter. Raw manure can have high levels of salts, which can possibly burn roots if too heavily applied. It is a good idea to let raw manure sit and mellow for a couple months, so that some composting takes place and some of the hot factors cool down. Well composted manure is a good source of nutrients, but also an excellent source of organic material to improve soil condition. Well-aged compost can usually be applied liberally around trees and it offers, not just nutrients, but improves soil conditions, keeps weeds down, and helps maintain soil moisture levels. Many forms of fertilizer can be applied through the garden hose as a diluted liquid. These often will have quicker acting effects, and can be better metered than granular formulations. With liquid formulations applied several times through the season, it can help provide continuous, even levels of nutrients to trees, while granular formulations usually provide one big blast. Heavy rain events can result in losing much of the granular fertilizers via leaching. When fertilizing with any form of fertilizer, try to calculate the rate to be applied either by following the manufacturer’s label, or by the basic rule of thumb above. Some math skills are needed depending on the ratios of N-P-K in the product. It is usually better to split your applications into 2 or 3 applications, with the first early in the spring before trees break dormancy, and then after bloom when fruit set is known. Try to be done fertilizing by the end of June normally, or when you start to notice terminal buds starting to set. After terminals buds set, fertilizing can sometimes cause them to start active growth again which may result in hardiness and tenderness problems later in the fall. Hitting the right “target” for your trees is both science and art (skill and experience). Over-fertilizing will result in too vigorous growth each year, while under-fertilizing will result in too little growth and stunting or runting of the tree. For healthy fruit trees, typical annual new growth for apples and pears will be about 1-2 feet each year. For stone fruits like peach and nectarine it is about 18-30 inches. Japanese plums will be about the same as they are more vigorous than many European plums, which can tend to be less vigorous. Sweet cherry can be in the 12-24” range, while tart cherry will be less typically. Remember! DORMANT pruning is a form of fertilization, since one is removing last year’s growth to promote proper tree form and structure, and often reduce over-cropping. So, if you prune off 50% of last year’s growth, that pruning is worth a fair amount of fertilizer that you don’t need to apply that year. SUMMER pruning has the opposite effect by typically reducing annual growth and removing the effects of fertilizer. If you over-fertilize in the spring and have too much growth and vigor, then summer pruning can help reduce that vigor, improve sunlight penetration, and improve fruit quality. Be careful not to summer prune too late in the season. Usually summer pruning is done in late June or July depending on where you live. Each year as you prune and fertilize your orchard, you will get better and better at determining the amount of fertilizer to apply each year. Remember, it is a balancing act between pruning, fruiting, and fertilizing. Good luck and have a good harvest! ← Heirloom, Conventional or GMO Variety? Some clarity on the debate.